If you desire additional information, contact Carol Brotzman at brotzman@dfnow.com. Some members of this family spell the name Sylvara. If you look on Route 6 in Laceyville the road sign records 5 miles to Silvara on one side and 5 miles Sylvara on the opposite side of the sign. The state covered all the bases with the named being spelled two ways. 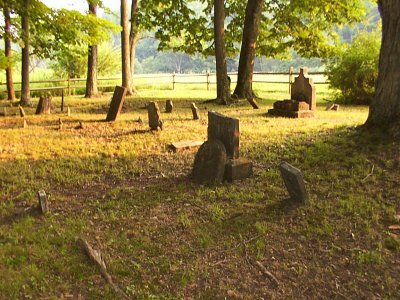 This cemetery is located along Route 367 in the village of Silvara. It is alongside the Tuscarora Creek, back in behind what everyone knows as the Gerald Scouten house. On the old photograph of Silvara looking north, with the Freewill Baptist church on the right side (see below), it would be on the left side of the bridge. This is a very small cemetery with not many headstones that are legible. There are about 25 markers and flagstones indicating graves, but we don’t know who all they represent. There must have been quite a few of the local townsfolks buried there besides the Silvara family. Note: This Charles was the son of Theodore and Margaret Newman Silvara. George H. Silvara, died in 1858 on the 25th day of ? Note: We cannot currently find anything more on this George Silvara. Note: We find nothing more on this child. In the family of Emanuel and Jeanette Silvara, there were 10 children; however, one daughter Louisa died as an infant. She does not have a headstone recorded. Could this be her? Note: We assume he is the Manuel Silvara married to Frances per information found on the 1880 Tuscarora Township census. He was born about 1857 in Pennsylvania. We again assume he is the child of Emanuel and Margaret Silvara, as they had a child named Emanuel born about 1857 per information found on the 1860 Tuscarora Township census. Jeanette Marsh Dexter Silvara died February 25, 1876, age 77 years. She was born about 1799 in Terrytown, PA. We do not know the name of her parents. This lady has her named spelled so many different ways, we do not know which is correct! Emanuel Silvara came from Portugal. When a lad he secreted himself on a vessel bound for the United States, and was discovered when a short distance from port. On landing in America, the captain sold him for three years to pay for his passage. 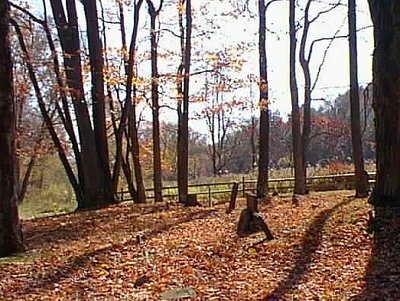 He served his time, after which he married and came to East Spring Hill about 1839, He bought the Crawford's farm, and, though to a great extent ignorant of our language and destitute of all advantages of education, he accumulated a fine property. The little village which has sprung up about the place where the old mansion was built is called Silvara in his honor. He reared a large and respectable family. Note: The Crawford place referred to in the essay on Emanuel Silvara is the former home of Alpheus and Martha Skinner Crawford, who moved to Lee County, Illinois. Their son Henry signed the deed in their absence. Note: We have additional information on a Daniel McGee, alleged to be buried in the Silvara Family Cemetery. He has no headstone but a Bennett family connection. Daniel McGee was born about 1846. Death date unknown. His wife was probably Adeline Bennett (1852-1940) buried in the Camptown (PA) Cemetery, the daughter of Samuel and Adelia Maxfield Bennett. Her death certificate records her as the wife of Daniel McGee. We can only find one Daniel McGee in the right age bracket in the area so we assume this to be the correct connection. He would be Daniel McGee born about 1846, the son of Ebenezer and Lucy Roots McGee. He was first married to Abigail Madison who died February 23, 1880 and is buried in the Madison Cemetery on Board Road. My aunt said that Daniel McGee was buried along the creek bank behind the Gerald Scouten house, which was to the left of the yellow house in Silvara (as you look at the front of the house) where Carl and Marion Carter used to live. My aunt indicated that the stones were probably not there any more as the creek used to overflow its banks quite often. The creek bed was repaired by the state in the mid 1980’s with rap rock after a crypt was exposed in the spring of 1983. The contents of the crypt appear to be the body of an infant, just a few bones remaining. Mike Lovegreen, a Soil and Water Conservationist who had been inspecting the creek for erosion found a skull of an adult in the creek bed itself. The exact identity of both bodies remains a mystery. The Wyalusing Rocket carried ab article in the spring of 1983. A photo by Kavid Keeler accompanied the article and showed the uncovered burial vault. The Silvara family placed a new split rail fence around the cemetery in August 1992 in memory of Lowell Judson Silvara 1911-1977. There is a large wooden memorial on the side fence. My ggg-grandfather Josef Silveira was a rich merchant in downtown Lisbon, Portugal. About 1774-1800, to keep his sons Joseph, 21, and Emmanuel out of the Army, he had the boys put on a ship for America. They were given plenty of money and clothes. On the way over the Captain of the ship stole their money and clothes and sold them into slavery, or the ship was wrecked off the coast of America with Joseph being picked up and taken to South America while Emmanuel came to America and married Jeanette Marsh in 1817. There are numerous Sullivan county connections with this family. The first may have been Sarah Bixby Silvara, wife of John Silvara/Sylvara, son of Emanuel and Jeanette Marsh Silvara. John drowned in the Muncy Creek and was buried in the Old Sonestown Cemetery. His headstone records: John Sylvara, 1830 to 1964, "son of Emmanuel & Jeanete Silvara" His widow Sarah married second to Isaac Sones and went west. You can follow this family with the history of the Sones family on the Sullivan County Genealogical Web project at the Sones and Stevenson Family History. Also, the Daniel McGee buried here had a second wife, Adeline Bennett, who was the daughter of Samuel Bennett who died while lumbering in Laporte in 1867. There is yet another connection to the Silvara/Sylvara name in Sullivan County. Ben Sylvara; son of Emanuel, was a prominent turn-of-the-twentieth century banker in Dushore, leaving numerous kin from and to this branch. We would love to hear from any of their descendants.